To manicure look perfect, it is important to cover the nail varnish. The number of layers depends on the type of enamel, its colors and the effect you expect to achieve. For the quickest drying nail Polish stock up on a special surface drying the manicure quickly hardens and will get luster. Opacity of the varnish depends on its texture. Before you begin the manicure, try the chosen method on one nail or plastic tips. There are some General guidelines. Classic enamel usually pretty tight - it can be applied in one or two layers. Matt varnishes require two-layer application, and the glitter - sandwich. The same number of layers required and translucent lacquers with a jelly texture. If you are planning a combined manicure, consider the number of layers of the substrate and a top coating. For example, for a light shimmering gloss can be applied two dense base coat, and then cover with the top with glitter or holographic effect. Consider the color of the paint. Usually dark and bright enamel have a more dense texture. Light can Shine through and lay down the strips, even after a three-layer application. In this case, will help a little trick. Before applying color nail Polish cover plate a dense layer of white enamel or tinted base. On top of it the varnish will go smoother and the stripes are not visible. Before use, be sure to shake the nail Polish until smooth. A varnish with glitter is better to turn and leave in this position for an hour or more. Settled on the bottom of the vial glitter particles will move closer to the neck, and it will be convenient to distribute on the nail. The number of layers affects the appearance of the manicure. Thin single-layer coating gives an effect of well-groomed hands and a slight hint of color. Therefore, applied a very light translucent varnishes and tools with fine shimmer. Three dense layer will provide a uniform opaque coating, but can kill the charm of some varnishes, making the nails "plastic". Learn how to paint your nails. First, apply a leveling base coat; let dry. Dial the right amount of Polish on the brush and apply three strokes on the nail. If the coating looks uneven, "striped", give him a little dry and cover the plate with varnish again. Try to keep the boundary layers coincide, otherwise the manicure will look messy. The final stage - top coat with drying effect. It for a few minutes fixes all layers of nail Polish, and manicure acquires hardness and luster. If the nail thickens, before applying it you need to dilute a special liquid. Squeeze the bottle a little thinner and gently shake the bottle, mixing tool. If necessary the operation can be repeated. Gel Polish is a hybrid nail Polish and gel Polish. During the application of the technology requires that the dispersion layer designed for better adhesion of layers of material, has been removed after the establishment of the nail. 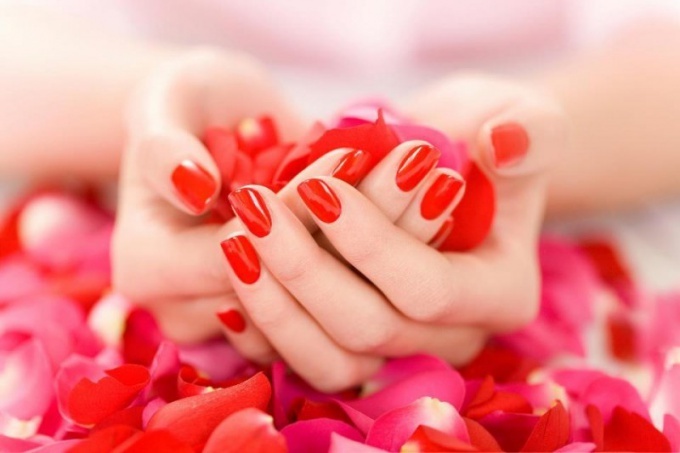 Manicure using gel Polish is accompanied by some specific moments. In particular, and removing the sticky layer of material. Masters of nail service insist that to remove the sticky layer, you only need a special tool – a cleanser. But at home you can use other tools. The cleanser is a liquid consisting of alcohol, water and perfume. Its primary use – removing the Shine from the natural nail and the sticky layer with gel, bio-gel, gel-lacquers. It is recommended to use the cleanser of the same brand as the gel Polish. Manufacturers designed so that all elements of the series (base gel-Polish, gel Polish, top for it and associated liquids) fit together perfectly, without disturbing basic properties. For example, the Irisk good cleanser removes sticky layer of gel varnish of the same company, without prejudice to them, and others can cause a negative effect. For example, the blurred color of gel Polish. If no special means, it is possible, exceptionally, to use homemade substitutes. For example, the means for removing nail Polish without acetone. It removes the sticky layer with gel Polish, in most cases without violating its properties. If the tools to nail Polish remover includes acetone, the color gel Polish turbid, and will act as a simple lacquer. Use diluted acetone is also impossible, since it will also take off all the material. Cleanser you can make at home if you mix alcohol and water (ratio: 30% alcohol and 70% water). It can be used to remove the sticky layer of gel Polish, this material is not cloudy, not erased, does not splinter in the future. Formic and boric pharmacy alcohol can be used undiluted because they do not affect the major properties of the gel Polish. Such a strong alcoholic drink like vodka, is also well cope with the removal of the dispersion layer of gel-lacquers. In most cases, without compromising the end result – manicure turns it that color, as intended. Colors are not pale, not turbid. Even expensive Shellac retains its properties, despite the fact that the manufacturer stated about the need to use only their brand associated with the type of liquid. How well the gel Polish will retain its properties after removal of the variance of the means at hand, depends not only on the tools themselves, but also on the quality of the material. Some budget series, unfortunately, lose their brilliance and begin to get cloudy, if you do not use professional clinkery.